1901, through November 2, 1901. 3,500 exhibitors along with 8 million visitors from all over the world were at the Exposition which occupied 350 acres of land. Admission tickets for this event were 25 cents each. The exhibits displayed beautiful and interesting wares, including the debut of the first X-ray machine. Many activities were also held at the Fair. In fact,T William McKinley, the 25th President of the United States, attended the Exposition and on September 6, 1901, gave a speech to a crowd of 50 people on the fairgrounds. After his speech, while in a receiving line, President McKinley was shot twice by an anarchist assassin, Leon Czolgosz. The President lingered for 9 days, passing away on September 14, 1901. Just think of all the history surrounding this Exposition and of all the toothpick/match holders in our collections that were souvenired at the Fair. The Pan-American Buffalo is one of these items. 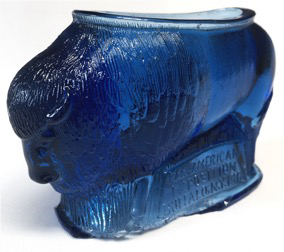 This holder is shown in Bill Heacock’s “The Glass Collector,” Issue #6, page 25, item #6. 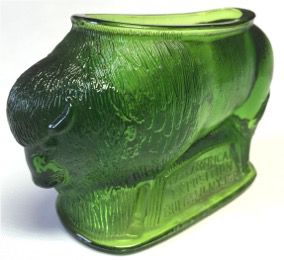 Heacock lists the Buffalo as “previously unlisted in glass literature.” He classifies it as a “paperweight/clip holder,” but since it has strikers on the sides, I would say it is a match holder which could also be used for toothpicks. 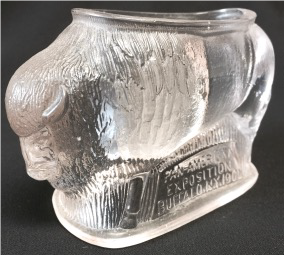 The Buffalo is embossed on the side, “Pan-American Exposition . Buffalo, N.Y 1901.” It measures 2 3/4” tall, 2” wide, 4” long and 1 3/4” deep. photos are examples in Amber, Clear, Cobalt Blue and Emerald Green. This holder is rare and hard to find. It certainly makes an excellent conversation piece. This is a toothpick holder that I do not own. Before seeing this one, I had only guessed that there was one to be found. The metal cage around the green Brazilian and the clear Brazilian is called a “corn shield cage”. The clear TP in the corn shield is the more common one. The green TP in the corn shield is VERY rare. Fostoria introduced this pattern in 1898 and discontinued it in 1915. Brazilian can now be found in five colors: clear, clear with the corn shield, emerald green, emerald green wit the corn shield, and a dark yellow honey carnival. I saw this toothpick at the 2014 convention in Oklahoma City. It was for sale but I was too late. It had been sold. I was very sad but when I found out it was going to a good home, I was happy. It now lives in Texas with Helen Boyd. She is the only collector I know who has all five versions. produced an almost identical type a few years later.” Manley was referring to Benjamin Richardson who had previously partnered with Thomas Webb. “Old employees told me (Manley) that only a limited amount was produced, it being discontinued because fumes generated during the making created a health problem.” This must be the reason more pieces of this glass are not seen. 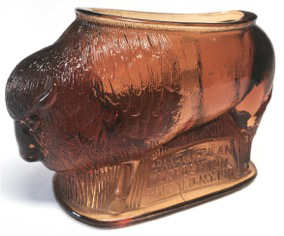 Webb’s Bronze Glass, as well as Richardson’s line of this glassware, is very rare. 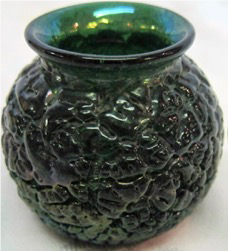 Pictured is a small English Bronze Glass vase which is 2 1/4” tall and 2 1/2” wide, just the perfect toothpick holder size. 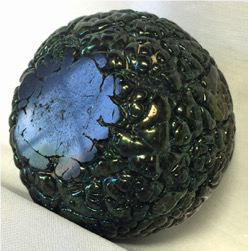 When held to the light, the holder is emerald green, but when looking directly at the holder, the outside surface looks black with a light iridescence. The bottom is fire polished and flat. 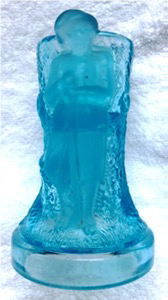 Without knowing the history of this rare glassware, it would be easy to pass a “good buy.” Below is the bottom view. applied to the infantry’s combat helmets. When participating in parades, the corpsmen do not march, they jog at a very fast pace. Shown in the photo is a match/toothpick holder created in the likeness of the Italian Bersaglieri made by French glassmakers. 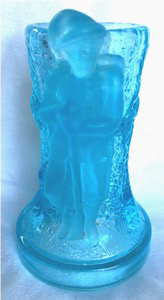 The holder is a transparent blue with a blue satin marksman standing in front of a tree trunk, holding a rifle in front of him. This rare holder was made by Fains near Bar-le-Duc, France, and was advertised in the “Glassware of Fains” catalog in 1889, #513. It is 4 3/4” tall, 2 1/8” wide at the base, and the bowl is 1 3/4” deep. The colors known are amber, blue, and clear - possibly Vaseline. 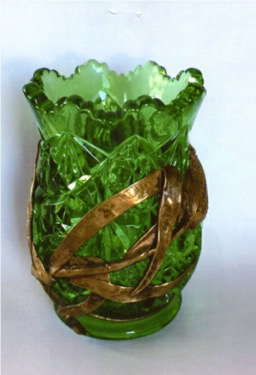 This holder represents a fascinating combination of Italian history and French glassmaking.